Once again CBA North’s news bring you a variety of pieces! A summary of the recently launched, and on-going, Dig Appleby project comes from inland Cumbria whilst the CITiZAN project invite you to a forthcoming training opportunity at coastal Tynemouth. These also show the diversity of community archaeology with the first run by a CBA North Group Member, the latter from a national project sponsored and hosted, in the north of England, by CBA National. In between Appleby and Tynemouth is the mass of the Pennines (with so much else besides) so we also include notice of a Nenthead conference on the Vieille Montagne Zinc Company of Belgium and their industrial legacy in the area, as well as noting details of other lectures of regular local archaeological societies series. This week sees the end of the Festival of Archaeology 2016, but also sees National Parks Week 2016 starting. CBA North includes parts of four national parks – Northumberland, the Lake District, Yorkshire Dales and North York Moors. This year’s theme ‘Adventure’ by the parks seems appropriate for all archaeologists and today we give you a number of choices for your own adventures across the region. The Committee of the Appleby Archaeology group were delighted to announce in June this year that the Heritage Lottery Fund had awarded the Group a grant for the first stage of our proposed community project to investigate the history of the town of Appleby-in Westmorland and it now has the official title of “Dig Appleby – Breaking the ground” and will run for a year. This first phase of the project will focus on the evidence for the medieval town of Appleby in Westmorland. This will be achieved through a combination of documentary research and archaeological investigation, for which full training will be provided. These investigations will be undertaken by members of the Appleby Archaeology Group and other local project volunteers drawn from the Appleby-in-Westmorland Society, Appleby residents, local businesses and other community groups. It is hoped that many local people will become involved. Appleby Town Council have indicated their interest in the Project and support has been received from Sir Martin Holdgate, who wrote the definitive history of the town in 2007 and from Cumbria County Council. A well-attended launch meeting took place on July 8th and since then 40 volunteers have signed up and there have been a thousand hits on our Facebook page which has been a very encouraging start. This summer we are starting our investigations at the site of St Anne’s Hospital, behind the alms-houses and the first geophysical study took place on July 16th when more than 30 adults and 4 children took part. The results show possible rubble/built up areas and a curious ditch-like feature, which we will investigate with the test pits. If you are interested then please contact us digappleby@applebyarchaeology.org.uk. Even more up to date details can be found on the Dig Appleby blog which can be found at http://milburnparishcouncil.co.uk/digappleby/. There are two regular local archaeology society lectures this week. The lecturer to The Society of Antiquaries of Newcastle upon Tyne – the SANT of our 2016 event listing – on Wednesday evening will be David McGlade speaking on the Hadrian’s Wall Path and the Roman Wall; your heritage in our hands. This will be held at the Mining Institute, Newcastle upon Tyne, at the usual time and place. Of our own Group Members the Architectural and Archaeological Society of Durham and Northumberland – the ARCH & ARCH of our 2016 events listing – will be on Saturday afternoon. 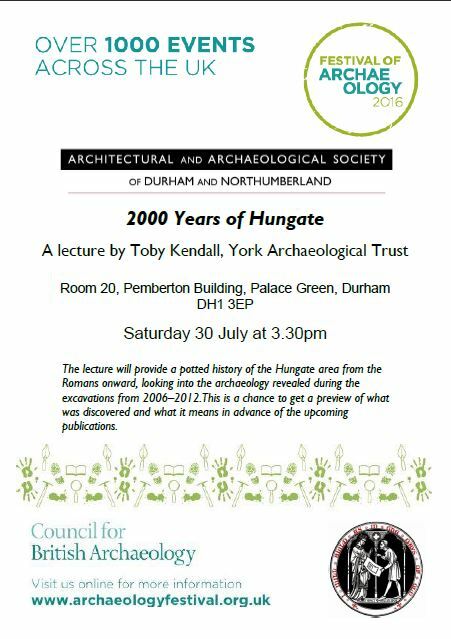 As this is part of the Festival of Archaeology please note the special and venue and time in particular for this lecture. Remember details for both of these groups can be found through our website (on the Local Societies and Groups page) if you would like further information or contact details. Other Festival of Archaeology events are still going on across CBA North’s region. These include a tour of Cresswell Tower, events at Segedunumn (Wallsend) on the Romans and at Tullie House (Carlisle) on the Vikings, as well as others again. Please let CBA North Committee know of any email or postal changes in address. Whilst our communications are largely email-based it is still helpful to have a postal address so we know the geographical spread and locations of where all our Members are based. If you have recently moved please email us to keep our details for you up to date. In the case of group members please also check that we have the current email and postal addresses of the two representatives you are entitled to. One of the benefits of CBA North group membership is that you can spread the CBA North information throughout your group however large or small that may be, but neither we or you can do that if we have inaccurate details. Mining is a feature commonly equated with the CBA North region – whether of coal, stone or of the wide variety of minerals as we noted with the Forgotten Minerals Conference earlier in the year. The Northern Pennine Orefield is roughly central in CBA North’s region spanning all of the historic counties of CBA North’s region. It has been the site of mining for many hundreds, if not thousands, of years in the past. The Vieille Montagne 120th Year Anniversary Event is a conference with a difference, but concentrates upon some of the more recent activities in this unique area. It is the Alston Moor Historical Society that is running this conference. The conference celebrates the anniversary of the arrival of the Vieille Montagne Zinc Company of Belgium in Nenthead, Cumbria, on 6th and 7th August. The first day will see a number of talks on the company locally to Alston Moor and internationally, as well as on ore processing, museums and the company more recently before a plaque is unveiled. The second day includes tours to further explore the area. These include tours above and below ground. Further details of the programme, contact details for booking and a link can be found at https://www.eventbrite.co.uk/e/vieille-montagne-120th-year-anniversary-event-tickets-22173356105?aff=es2. 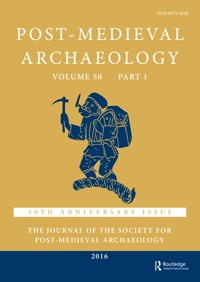 Sharp-eyed members may also notice articles that include Eyemouth Fort (which the Border Archaeological Society has been interested in over recent years) and a reference on scanning osteological remains (by the Chair of the Teesside Archaeological Society and his co-workers). Megan Clement of the CITiZAN project, who has written for us before, has sent us details of the next northeastern event for this project. This will be a training event at Tynemouth recording the remains of a lifeboat slipway at Priors Haven on the 6th and 7th August. The slipway may have been one which the first purpose-built lifeboat, The Original, used. If anyone is interested in attending you should sign up at https://www.eventbrite.co.uk/e/training-tynemouth-lifeboat-slipway-tickets-26376976246. If anyone has any questions for this work or more generally, please get in touch with Megan direct on 01904 521249 or 07718 570386 or through her email address MClement@mola.org.uk. The next CBA North email will be in August; please send on any information you would like to publicise in plenty of time so we might be able to promote your own events here. Our last email was read by a little under 200 people with similar interests in the history and archaeology of the north of England. This entry was posted in E Newsletter and tagged AASDN, Appleby, CBA North, CITiZAN, Coastal, conference, fieldwork, Hadrian's Wall, Post-Medieval, Roman, SANT on July 25, 2016 by cbanorth. The CBA North region is a huge one and one of many different contrasts – coastal and inland, urban and rural, lowland and upland, as well as of district, county and unitary authorities. Here we bring you news from two different locations from almost the very limits of our region in the very north and very southwest. 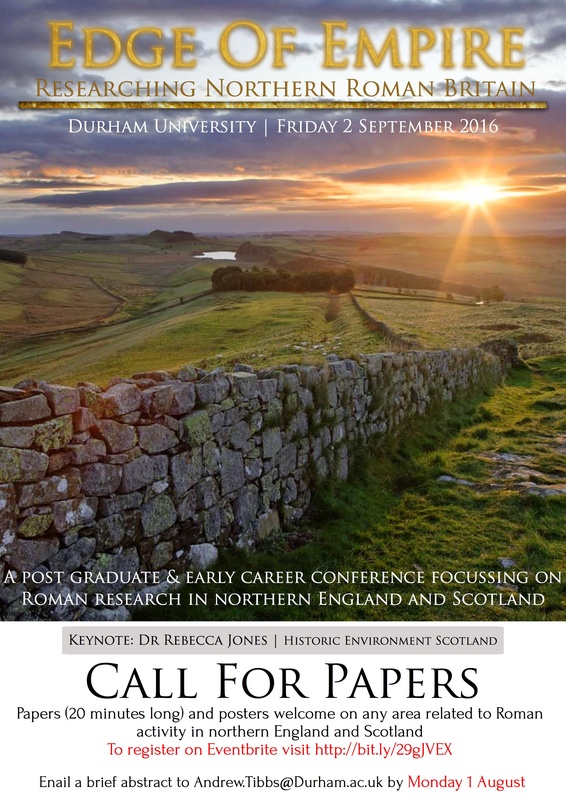 Looking further ahead we also bring news of a conference coming up in September at Durham but covering the larger region – perhaps that has the right idea in calling us all Northern Britain?, but therein at times a further contrast with parts both inside and outside the Roman Empire. In north Northumberland we hear that the local group TILLVAS have an exhibition of their recent researches. Every Tuesday, Wednesday and Thursday during July from 11am – 4pm in ‘The Poultry Shed’ at Heatherslaw Mill will be a display of old maps, documents and photographs for the Branxton and Crookham area. This includes details of progress made on the Village Atlas whose events we have previously covered in our blog and website. There is no admission charge to the exhibition and an invitation to all is extended by TILLVAS to call in. As part of the Heritage Lottery Funded Headlands to Headspace Scheme we have a number of great FREE training opportunities coming up in July at Cockerham Sands, near Thurnham. These archaeological training events are being held as part of our wider ’Bay Archaeological Festival’ programme celebrating the Festival of Archaeology (16th to 31st July) which is outlined at http://www.morecambebay.org.uk/events/bay-archaeology-festival. I am hoping lots of people in the local community and beyond get involved, helping us explore and record the past of this interesting area. Firstly, we have the opportunity for people to get to grips with archaeological geophysical survey and join us on a comprehensive training course delivered by experts from Archaeological Services Durham University. Starting on the evening of the 25th July at Thurnham Village Hall participants will be part of an evening workshop detailing the theory and methods behind the techniques. The following two days will involve on site survey, using a variety of techniques to explore what might be buried beneath the soil. The site we are looking at it situated between Cockersand Abbey and a WW2 Observation Tower, so there is potential to locate both military and possibly earlier remains. There is an optional follow up session on the morning of 28th July, back at Thurnham Village Hall, where we will be looking at how data is processed and analysing the results. Spaces are limited on this great opportunity and early booking is recommended. See https://www.eventbrite.co.uk/e/bay-archaeology-festival-geophysical-survey-training-at-cockerham-sands-tickets-25997629610 for details. Working alongside a team from Manchester Metropolitan University we will also be exploring the WW2 heritage of this area, which was used for RAF training. The team from MMU will take participants through the processes involved to research the historical background to a site, before making a permanent record of the Observation Tower using a variety of building recording techniques including photogrammetry. These training workshops will be held on 26th and 27th July and compliment the geophysical survey work. Again places are limited and early booking is recommended. See https://www.eventbrite.co.uk/e/bay-archaeology-festival-military-heritage-recording-at-cockerham-tickets-26145045535 for details. Both opportunities are suitable for those interested in knowing more about archaeological research/recording or people wanting to enhancing their archaeological skills. No experience is necessary and we will provide all equipment. If you wish to know more about these opportunities or the wider FREE programme of the Bay Archaeology Festival, please do not hesitate to contact me. Andrew Tibbs, a postgraduate at Durham University, has sent us details of this conference in coming up in September. He writes that the call for papers has been extended as there are a few slots left for speakers and that registration for the conference is also now open and can be made through https://www.eventbrite.co.uk/e/edge-of-empire-researching-northern-roman-britain-tickets-25658901465. Remember details of each of these local groups can be found through our website (on the Local Societies and Groups page) if you would like further information contact details as to venues and times. This entry was posted in E Newsletter and tagged CBA North, exhibitions, fieldwork, Hadrian's Wall, research, Roman, TillVAS on July 10, 2016 by cbanorth.